ON THIS DATE (June 6, 1948 ... A banner crowd of 34,251 fans had a grand day of baseball at Fenway Park, as Joe McCarthy's rebounding Red Sox twice downed the Detroit Tigers by scores of 5 to 4 and 12 to 4, to capture their second doubleheader in a row and run their present winning streak to five straight games. In their most productive afternoon of the season. Ted Williams, Stan Spence and Vern Stephens sent three successive home runs out of the park in the sixth inning of the second game. Dave Ferriss pitched 7 1/3 scoreless innings, granting but three hits in a relief role. The Sox made the Tigers use eight of their 10 pitchers during the course of the afternoon. Ted Williams boosted his batting average to .391 by going five for eight, including his 12th home run and two doubles. Stan Spence and Vern Stephens each homered twice for the day, with Stephens knocking in the final three runs to pull out the victory in the opening game. Birdie Tebbetts went three for four in the second game, giving him seven hits in his last 12 at-bats, including four doubles. Mickey Harris started the first game for the Sox and had just one bad inning, the third. It cost him three runs and gave the Tigers a 3 to 0 lead. The Red Sox got back into the game in the sixth inning when Ted Williams doubled to left and Stan Spence slugged his fourth home run of the year, curving around the foul pole into the right-field stands, cutting the lead to 3 to 2. The Tigers bounced back in the next inning to extend their lead to 4 to 2. But then Virgil Trucks couldn't hold the lead for the Tigers in the eighth by walking Ted Williams, who rode home on Stephens' eighth home run of the year into the left field screen, to tie the game. Al Benton came in to replace Trucks in the ninth and walked Dom DiMaggio on four straight pitches to start. He then walked Johnny Pesky and was replaced by rookie left-hander Walter Pierce. Pierce faced Williams and walked him to also load the bases. That brought in Hal White, who struck out Sam Mele, but then Vern Stephens slapped a two and two pitch into right field for the walkoff game winner. In the second game, the Tigers got four runs in the first two innings. But the Sox then went to work in the second inning. 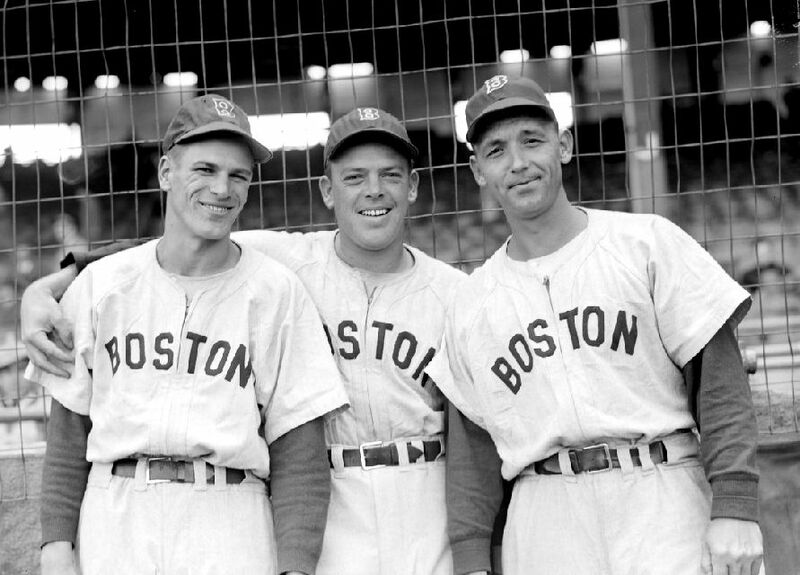 Vern Stephens reached first on a base hit and doubles by Bobby Doerr and Birdie Tebbetts produced two Boston runs. In the third inning the Red Sox put the game away as they batted around and scored four runs to give them a 6 to 4 lead. Singles by Williams, Doerr, Goodman and Ferris, with walks to Spence and Tebbetts produced the runs. In the sixth inning, Dom DiMaggio singled and Williams hit a home run that curved into the seats around the foul pole in right. Stan Spence next belted a two and two pitch into the same area and Vern Stephens parked his ninth home run of the year into the screen in left, for three home runs in a row. The Sox scored their final 12th run in the seventh on a double by Birdie Tebbetts and a single by DiMaggio.